The mock drafts and grades are up and if we can get either Deandre Baker or Byron Murphy in the draft I'd highly prefer that to paying unreal money for mediocre free agent corners. And weirdly enough you can get probowl caliber safeties for pennies. Free agency for safety, first round on a corner, later rounds for linebackers and maybe a RB. Thank God. So tired of that clown. He thinks he's Deion and plays like 1/5th of him. I have seen some talk in here about OL. I think we need to remember Kahlil McKenzie too. We never put him on the practice squad but he was also never active for a game. Interesting way to "hide" a player to keep them from being poached. Maybe our replacement for Erving at LG? good enough or do we need to get a new center? Nelson clearly has short man syndrome. I have seen some talk in here about OL. I think we need to remember Khalil McKenzie too. We never put him on the practice squad but he was also never active for a game. Interesting way to "hide" a player to keep them from being poached. Maybe our replacement for Erving at LG? As for Morse, I agree that we should move on. But then the question is, is Austin Reiter good enough or do we need to get a new center? yip - i was going to post the exact thing. All of this and the fact that he NEVER TURNED AROUND when defending the pass. Ok, he did a little bit toward the end, but for the most part he was a guaranteed PI penalty for always keeping his back to the ball. Yeah, I forgot about him. Surely he's ready to make the active roster next year. Still ,with the QB we have now, it would be prudent to continually draft OL in the first 3 rounds every year. It's now probably the most important position. I love McKenzie's potential, if he's ready this year, I think he will start. I believe that Veach signed Reiter and Erving as insurance policies in case they aren't able to acquire other linemen. If they get to draft day and have a great chance to grab a center with good value, I think they will. But if not, they've got a couple guys in place that can start if need be. Think there’s a good bet that one of these guys is a Chief next month. Draft isn’t particularly strong at the position and it’s our biggest need. 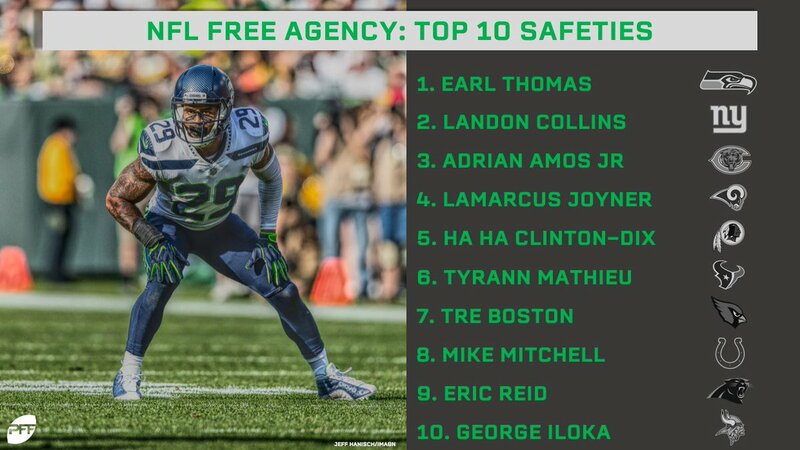 The top 10 safeties expected to hit free agency this March. Draft CB, look for FA safeties.